"A Thrilling Experience…With The Eternal Enigmatic Being"
"It was a thrilling experience… an experience that is etched in my memory for ever!" 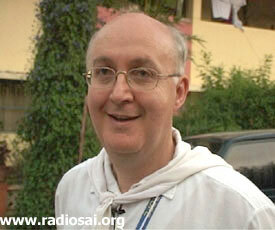 a Sai devotee, with an expression of great fulfillment and joy on his face, says. 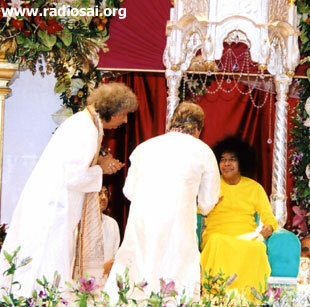 He was a witness to the glorious ‘festival of bliss' that was the 80th Birthday celebration of Bhagavan Baba on the 23rd of Nov, 2005. "Whenever I recollect those blissful moments…. ", another devotee, his face shining with a great sense of elation says, "…Swami in the bright yellow robe seated on the swan-like grand silver throne… so majestic, so magnificent and so full of benevolence with a beatific countenance on the Birthday evening… the lotus-shaped impressive stage on the west from which soul stirring music by the who's who of Indian music was filling my heart …every artist weaving magic with the instruments and their voice, enlivening every cell of my being… And then, the laser show! I can never forget that. 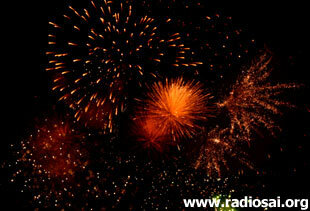 What a grand finale! The laser show just arrested me with its myriad patterns frisking and dancing in perfect synchronization to the scintillating digital music, accompanying this, were the fireworks! Sparkling beams of bright light on that pleasant star-studded night…bursting and brightening that beautiful night…an unforgettable play of light and sound… add to this, the cool breeze… and ultimately, and most importantly, all this excitement in the immediate divine presence of the Eternal Enigmatic Being, my most beloved Baba - the very light of my life. No one present there could remain untouched with the magic of the moment and I was no exception!" concludes a Sai devotee who had come for the occasion from Orissa, a state which is miles away from Puttaparthi. 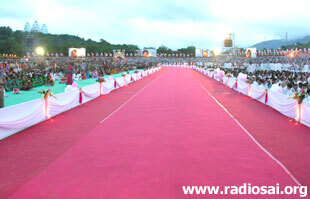 Every devotee who was present in the Hill View Stadium on the Birthday evening can very easily relate to this. Truly, the 80 th Birthday celebration was extraordinary. It was festivity at its best. Every devotee who had gathered for the occasion went home with memories to last a life time. Memories that drench every cell of their being with love and bliss whenever recalled. It was to enjoy this moment with Sai on the 80th year of His earthly sojourn, to make the moment as special as possible, to make the long-awaited day as glorious as it could be that a sea of humanity had gathered. Truly, it was a birthday by the devotees, for the devotees, and in its truest essence, of the devotees. Truly the most precious day for every devotee is the day Swami entered his/her life and for each one of them the Lord's Birthday is an event head and shoulders above their own birthday. 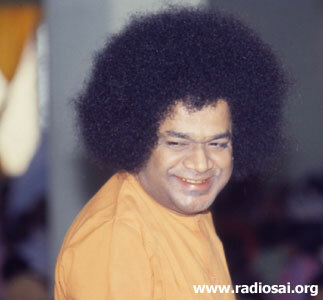 Swami, pure selfless love that He is, if He were concerned about anything during the Birthday celebrations, it was about the devotees comforts and their well-being. Elderly devotees who were in close physical proximity of Bhagawan only know how Swami used to enquire everyday about the arrangements made for the devotees concerning their food and stay - and least about what major functions were being planned for the Birthday celebrations, be it dances, concerts, or fireworks. Whenever the elders who were chalking out elaborate plans and embarking on grand ideas to mark the day presented Swami with their plans, He would be quite uninterested, to say the least.To get His consent to make more shelters for the devotees would be far easier than to organize say, confetti being sprayed from a helicopter on the Birthday morning. ‘Big Stars' Came Because THEY Wanted To! If the big concert happened and leading musicians played, it was because they wanted to be part of the celebrations. It was a cannot-afford-to-loose opportunity for everyone. If the fireworks or the laser show glittered and lit up the night sky and provided a grand finale to the celebrations, it was because the organizing devotees had not only worked hard night and day for it but also prayed even harder that they be allowed to have the show. For, as already mentioned, with Swami to organize a mass marriage or mass feeding for the poor is easy, but never a cultural or entertainment extravaganza. 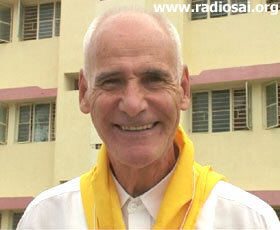 As ever, never an invitation was sent to anybody to come to Prashanti Nilayam. Devotees poured in hundreds and thousands from the 18th of November when the Rathotsavam (Chariot procession) was celebrated, as is done every year. The Ladies Day celebrations followed on the 19th Nov. Responding to the prayers of more than 11000 delegates gathered for the 8th World Conference, Swami consented for the World Conference to be held for two days on the 20th and 21st Nov. On the 22nd was the Convocation of Sri Sathya Sai Institute of Higher learning with the Governor of Karnataka being the Chief Guest and finally the D-Day was on 23rd Nov.
A plethora of distinguished personalities – politicians, musicians, sports-persons, educationists, doctors, lawyers, you name it from every field – and a large motley multitude comprising of Sai devotees from more than 145 countries had converged to pay their homage to Baba - their beloved, their divine mother and father. 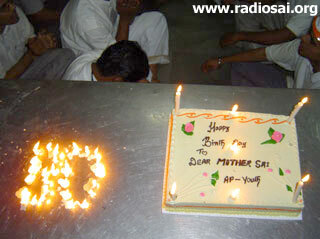 "One would think that celebrating 80 th birthday at Prashanti would be very festive; perhaps it was so for lot of devotees. For me, however, celebrating our lord's 80 th birthday was more like being part of an exciting family function, like a marriage of a brother or kid sister." "I'm proud to be here. The conference is very well organized. The people here are very well taken care of. In spite of the huge crowd everything is working nicely. We are all mingling as a human family. We can experience the one through the many." In fact, this was the feeling that many devotees echoed and the whole celebration transformed itself into a grand family function…a great family union. 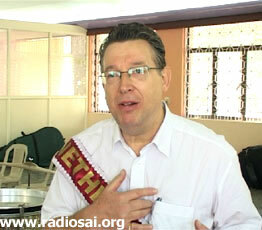 You could see the theme of the world conference – Unity, Purity and Divinity - in action. And Swami, the divine mother, played the role of a host to perfection to the thousands who had gathered to receive His love and benediction. "I have only spent 7 months with Swami. I hope to spend more time and I have been blessed to be here for the birthday celebrations. Swami is just taking care of all. 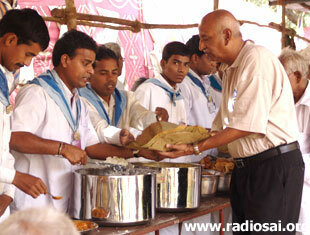 He is feeding thousands of people and not one is being left with an empty stomach. They don't put a limit as to how much you can eat - you can eat as many times as much as you want, it's incredible, I have never seen anything like it!" Yes, incredible it was! In the Birthday week at least hundred thousand breakfasts, lunches and dinners including snacks were served every day. Every devotee looked at the arrangements made with awe and wonder. "I've attended the other birthday functions, the 70th, the 75th, and in each one of them you see a tremendous amount of love and dedication from the Sai devotees, especially in all the arrangements they make for the devotees. Everybody gets fed and there are almost a million people! There is never any violence or any other incident here! Everything is conducted in an atmosphere of love and dedication and respect." Many Keenans and Kamaths like this who had come from all over India and the world, while enjoying the elaborate arrangements made for the devotees, wondered - "How does this all happen?" HOW WAS THE MAMMOTH UNDERTAKING ACCOMPLISHED? How lakhs of people were assiduously fed everyday? 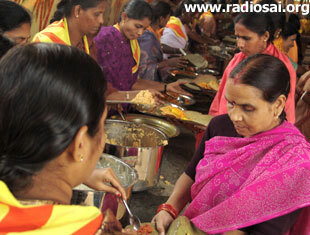 How did the Ashram canteens and their staff cope with such tremendous pressure? How were tens and thousands who landed in the small holy town accommodated? 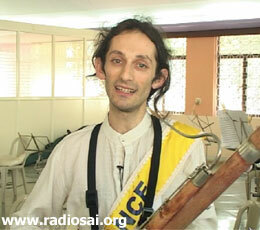 Who looked after Ashram security? Who looked after managing the tremendous crowd at every gate and every point of action? Who metamorphosed the Hill View Stadium from a cricket field to a big open air theatre? Who did the planning at the many levels and of course skillfully executed it all? It is to provide clues to questions like this and to pay our tribute to thousands of Sai volunteers who worked tirelessly, anonymously and selflessly behind the scenes for weeks together, that we have this special cover story. Many would not know that the planning for the Birthday celebrations began with the dawn of 2005 itself and it gained vital momentum during the Guru Poornima celebrations in July 2005. The All India President, Sri V Srinivasan, in right earnest, called a meeting of all the State Presidents of Sri Sathya Sai Seva Organisations of India and formed the main Organizing Committee. Simultaneously various Sub-Committees were formed for various specific activities like the Food Committee, Accommodation Committee, Security Committee, Decoration, Sanitation, Health and Hygiene, etc. The most crucial of all was, understandably, planning and organizing food for lakhs of devotees every single day for the whole Birthday week from the 18th of Nov to the 24th. It was a mammoth undertaking and every devotee who came for the birthday went home with pleasant memories of the variety of dishes that were rolled out in all the seven days – each day's menu being special and different. But nobody knows how many selfless men and women with blue and orange scarves had worked towards this end, not for days and weeks but for months. 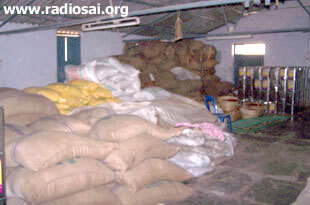 In fact, the first meeting of the Food committee was organized by Sri S G Challam, the Service Wing Coordinator of Sathya Sai Seva Organisations, Andhra Pradesh, and a member of the Food Committee on the 20 th and 21 st of August 2005 in Guntur, a city in Andhra Pradesh as Andhra was assigned a major role in the food management. It was a conference of elders, active workers, experts, planners and thinkers where modalities of discharging the major responsibility of food was discussed in great detail. Data from previous world conferences were studied, a reasonable estimate of men and material was made and men of experience and expertise were identified for each activity. It was going to be a "Anna Yagnam" – a great sacrifice of offering food to thousands and the whole Sevadal cadre of the state was really gearing up for it. 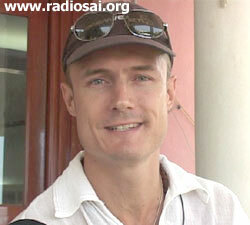 Soon this was followed with another conference again in Andhra Pradesh, but this time in the city of Rajahmundry . Now finer details of every activity were worked out and planning went to micro-level. Various sub-committees like Manpower planning, Material procurement, Material Handling, Stores, Cooking, Kitchen Utensils, Kitchen Sanitation, Transportation, Distribution, Registration, etc. took shape and committed volunteers with experience were picked up to lead these committees. The role of every volunteer involved was clearly defined. The preliminary menu of the dishes was also made, estimates of the material required done and sourcing of all the materials, from utensils and vehicles to knives and brooms started immediately! While Andhra Pradesh offered rice, oil, tamarind and spices, Tamil Nadu said it will take care of all the vegetable, sugar and tea requirements. Punjab joined in to offer a variety of pulses and wheat flour while cooking oil came from Gujarat . Similarly, Kerala offered jaggery and vermicelli and the state president of Madhya Pradesh said all beaten rice and some pulses would come from his state. All tea and coffee would come from Karnataka and Assam. Bihar and Himachal Pradesh would supplement the milk supplies. Like this, every state wanted to be a part of this sacred undertaking and every state supplemented the rest of the requirements and lent their helping hand in every manner possible. 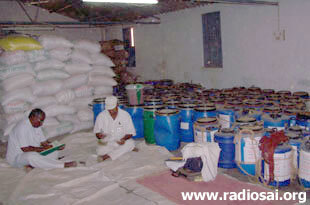 It was decided that by Nov 10th all the supplies would reach Prashanti Nilayam, and that's what precisely happened. The execution stage had begun after months of planning. Now with the supplies in place, activity shifted to preparing the infrastructure in Puttaparthi. Four kitchens were readied for the purpose – The South Indian Canteen, the North Indian Canteen, The Andhra Kitchen behind the North 3 Block and the newly constructed make-shift Punjab Kitchen behind the North 5 Block. 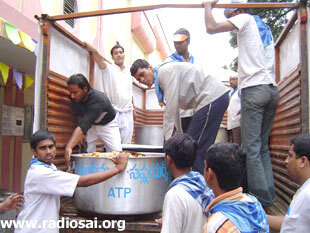 Four main distribution points were identified inside the ashram with totally 80 food counters! 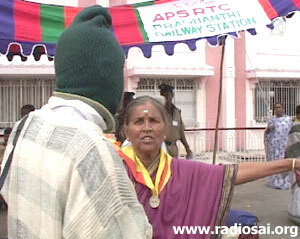 Two distribution points were meant for devotees and two were for delegates. For men devotees there were 25 counters and for women there were 27. For the delegates, there were 13 counters for gents and 15 for the ladies. Additionally, there were separate counters for staff, police, Sevadal volunteers, press and the physically challenged devotees. Temporary sheds were erected with proper water facilities and barricades at appropriate places were raised for smooth flow of traffic. One main store and four sub-stores – one for each Kitchen – came up. Four tractors, six mini-trucks, two vans, a mechanized hydraulic trolley and two hydraulic fork lifts drove into Puttaparthi for distribution of food from the Kitchen to the various distribution points. The information and communication accessories like computer systems and wireless sets were organised. 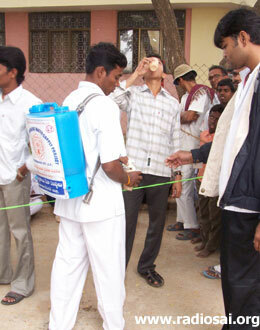 Water points were set up at various locations inside the ashram to quench the thirst of the teeming crowds. Similarly, to maintain cleanliness, there were garbage bins at suitable locations. The Sevadal Volunteers Kept Coming…. Now, who was doing all this? By 16th of November, nearly 2,500 Sevadal volunteers from all parts of India, with a majority from Andhra Pradesh, had gathered and were in action. This number grew to 3,000 by 19th Nov and on the Birthday there were nearly 4,500 volunteers who had literally taken charge of every aspect of the Birthday celebration. 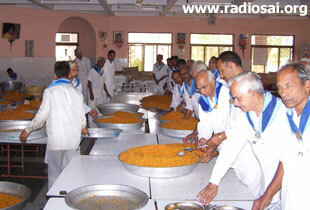 They were ubiquitous in the Ashram and their dedication to selfless service was contagious. A large number, nearly 60% of them were from the home state of Andhra Pradesh. Another 20% came from the neighboring state of Orissa, Karnataka and Tamil Nadu. The rest were from the far away states of Haryana, Delhi , Punjab and the like in the north, Sikkim and West Bengal in the East, Kerala in the South and Gujarat in the West. More than 40% of this workforce were in their thirties and they were ably supported by another 40% who were middle-aged. Every activity from major to the minor was carefully thought through and executed. For example, once the menu for the seven days was finalized, the cooking of various items was beautifully shared among all the four canteens depending on their strengths and skills. During the Birthday week, the typical menu for the day included idli and upma or pongal with chutney for breakfast; puri or chapathi, flavoured rice, vegetable curry, curd rice, pickles and a sweet dish for the meal sessions, and pakoras, vadas, etc. to go with tea and coffee during snack hours. While breakfast items and flavoured rice were prepared at the Andhra Kitchen, the Punjabi kitchen took charge of preparing the chapathis and puris and the appropriate side dishes such as peas curry, paneer curry, etc. Curd rice, coffee and tea were the domain of the South Indian canteen while the kitchen attached to the North Indian canteen supplied the snacks and sweets for the afternoon tea. So, it was a great collaborative effort making optimum use of all the resources – men, material and expertise - available. The food arrangement being the most challenging operation had more than 30% of the volunteers working on its various aspects. To this workforce joined another 400 young enthusiasts – The Hyderabad Sai Youth Group. "The dedication and commitment of all these volunteers is to be seen to be believed," a senior member of the Sai family said. In the course of one week, more than 6 lakh devotees partook of the Prasadam Bhagavan had so graciously blessed them with. It was Bhagavan's command that no one who came to Prasanthi Nilayam should go hungry and so there were days when food continued to be plied to the counters long after the regular hours. Indeed, on November 23rd, the lunch session that commenced at 10.30 a.m. continued till tea-time at 4 p.m. and the tea session spilled over to the dining session which concluded only after 9.30 p.m. Thus, on that day, the kitchen fires never stopped blazing and the volunteers were on their feet all day distributing and serving the food at the counters! And were all the distribution points only inside the ashram? No. Apart from the four distribution points inside the Ashram, food had to be transported to the Primary school, the Higher Secondary School Hostel, the Senior Boys Hostel, the Bangalore students Hostel, the Anantapur girls Hostel, the Staff quarters and even to the railway station! "I smiled out of joy as I looked upon the station forecourt. On the left were many tents under which full meals of prasadam (rice and sweets) were being served to the just arrived railway passengers in perfect discipline. This was such a caring gesture which seemed to assure the devotees that the rest of the facilities would be of the same thoughtful nature. There were a host of Sevadals on duty and the blue and white scarves gave me a feeling of being welcomed home. The 80th Birthday fervour was sparkling in the air. It was the 21st November, and the overcrowded station bore testament to the lakhs who were converging to celebrate the biggest birthday party on the planet! Such a huge number of people required a similarly matched amount of shepherding, guidance and practical help. And this was evident on leaving the station steps. A fleet of shiny new blue and white buses were arrayed to take us to the ashram just in front of the station. I stepped into one and was immediately welcomed by the other passengers. 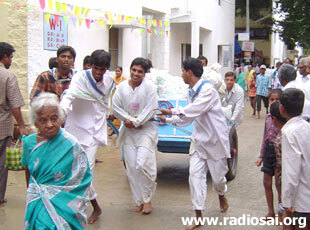 We were all Sai pilgrims going to see our Master and the shared excitement was palpable. The journey was short and then we were left to merge with the sea of humanity who were blessed enough to seek His Grace and join in the Party at Puttaparthi – one of the best days of my life!" 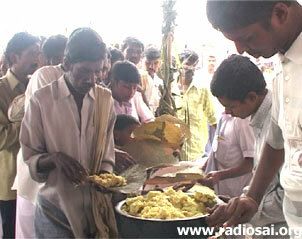 That was not all, there was a distribution point in the Puttaparthi village too! There was a counter set up at Sri Pedda Venkama Raju Kalyana Mantapam, so that devotees staying outside would not be put to the inconvenience of having to stand in long queues inside the ashram. 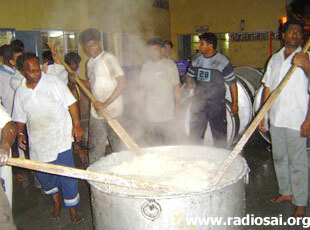 In the seven days of cooking, more than 170 tons (170,317 kgs) of food material were cooked. Rice alone, of this, constituted 45 tons. 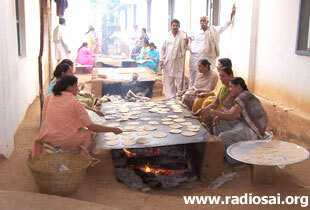 Chapatis and puris were made out of 14 tons of wheat flour. 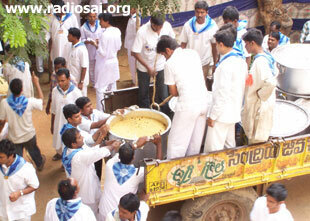 18 tons of oil was consumed and 13 tons of sugar went into the sweets and other preparations. And then, 50,000 litres of milk were used for various preparations apart from tea, coffee, etc. while 31 tons of vegetables were cooked and 12 tons of pickle was served. "They were not superhumans, but with the unlimited strength and endurance they derived from Bhagavan, all the fatigue and stress were forgotten. They braved the weather that suddenly turned inclement, never allowing their enthusiasm to flag or the work to be disrupted. They would cheerfully go about their work, singing Bhajans full throated, thus motivating each other and also charging the atmosphere with such divine vibrations of the sacred Name of the Lord." "In the Punjab Canteen, as the volunteers rolled out the chapathis in thousands, a young man gifted with a melodious voice kept their spirits up by singing Bhajans without break for up to eight hours! Can you imagine that! Theirs was a labour of love… a tale of great sacrifice. They wanted no reward, no recognition, no appreciation. The work itself was the reward. Most of them, you won't believe it, denied themselves the bliss of having Bhagavan's Darshan or witnessing the grand celebrations at the Sri Sathya Sai Hill View stadium, though they had come from states thousands of miles away. Their focus and dedication was complete, to say the least. Yes, they did not see Bhagavan, nay physically, because they saw Bhagavan in their work, every moment. They did not miss Bhagavan on that auspicious day too for their hearts and minds were with Bhagavan, always." After the cooking, the next major task was to ensure that the food cooked reaches the distribution points in time from the different canteens. 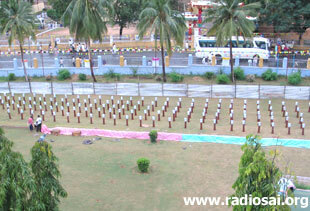 This is the area where the Andhra Pradesh Sai Youth did a splendid job, as ever. They have been handling such work whenever there is a big event in Prashanthi Nilayam and during the 80th birthday they again amazed everybody with their energy, expertise and meticulous planning. You could see that they were putting their corporate experience to full use by the way they went about doing their task – days ahead of the birthday week they were identifying and numbering the different routes to the distribution points, stocking adequate number of vessels required for every route, estimating the vehicles and number of trips required for each route, clearly marking ‘From' and ‘To' destinations with the Vehicle in-charge's name and Mobile no. on the windshield of each of the 9 LCV's and two pick up autos, constituting separate loading and unloading teams for each vehicle, positioning multi-lingual experienced youth in each of the four canteens to bring about perfect coordination with the distribution points as well kitchen in charges and of course, picking the right persons for the right jobs. "I was part of the Youth group from Hyderabad and was thrilled to take up the responsibility of food distribution to the Schools, Colleges, Railway station and the multiple Canteens for devotees. With an International MBA degree I was ready to take the task head-on using my Project and People Management skills, only to fall flat and realize on the first morning itself that the task was beyond the capabilities of a single human being or even a group for that matter. It needed united human intervention at the physical level and abundant Divine Grace for all the activities to come together and fall in place. And they did, very magically!! People from different parts of the country met and instantly/naturally became aware of the Universal Brotherhood (and Sisterhood!). With the mornings starting at around 3 am, after an almost oblivious 2 hour nap, and continuing until mid-night there was no time to think about the "differences", the body and the clothes. The only awareness was of the fact that we were all there for our beloved Bhagavan and we had a role to play in the historic event. At home where we seek help to lift a gas cylinder or for that matter the study chair, here the potential multiplied multifold. A heavy vessel needed not more than 5 Sai Children, Sai's name did the magic." The youth not only transported food items, they were engaged in other activities in the kitchen too like the cleaning the vessels, kitchen sanitation, etc. And like Ravi Kiran many youth realised that they were doing things that they had never imagined themselves capable of doing! "During the activity I could see myself doing things that I otherwise would not push myself into – getting up at 3 in the morning, or lifting super heavy vessels, etc. Often I was compelled to take a leadership stand and manage the team as if I was in some sort of warehouse doing just-in-time material management. All in all, with the encouragement of other Sevadal, elders and undeniably Swami's grace, the activity floated to completion just as easily as it got ramped up. That is, the end of the Seva was just as graceful and unclimactic as the beginning. As such was the case, I am left to wonder if WE really did anything in the food transport, or, was there some other unseen hand?? I am a conventional fellow. I can't venture a guess about some magical stuff influencing our deliveries in some unseen subtle ways. I can only say that while doing our Seva duty, we thought we were doing some ‘hard work', but really we never were stressed or strained, instead, we walked away with the gift of thrill in our hearts. Sometimes this feeling was so abundant that we expressed ourselves freely on the tractor routes with some fast and furious bhajans and shouts of "Sathya Sai Babaji Ki Jai". On the day of the birthday, some of us spontaneously wrote love letters to Bhagavan on our white T shirts. That is, it was not uncommon to see lot of us with pink and blue crayon scribble of "Happy Birthday to our most beloved Bhagavan" on our dirtied white T-shirts. Loud bhajans on delivery routes, shouts of "Jai" to Bhagavan on loading docks, painted T-shirts… now does that sound like hard work? No. To me it sounds like a family function where the kith and kin were enjoying the occasion. And, that is exactly how I would characterize our Beloved's 80th birthday service activity." Yes, for the youth it was a great family union…a grand get-together to celebrate the birthday of their divine mother, the mother who is most precious than all the wealth of the world. And they did everything that is possible, the hard work and the unearthly working hours was never a pain, it was a blessing on the contrary. "Throughout the duty we were surprisingly unmindful of the birthday Darshan or bhajan activities. 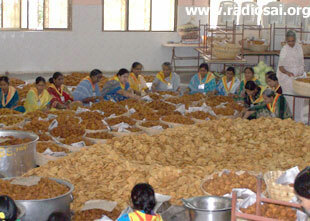 Our world was food and its timely distribution to the devotees. Despite enduring some of the so-called "hardships" – which, by the way, never appeared to us as such – and, despite not having a chance to even glimpse Bhagavan even for a moment during those famous birthday days, we never felt saddened or felt deprived of anything. The thrill of Seva, the excitement in the air, the rush of work was so palpable and enveloping us that we rarely missed the other stuff. It was as if the joy that all the other devotees had enjoyed was somehow packed in Seva and delivered to us in disguise as "the rush" from doing a good activity." "It rained the day before the Birthday and the Roti making facility got flooded in the Punjabi Canteen. 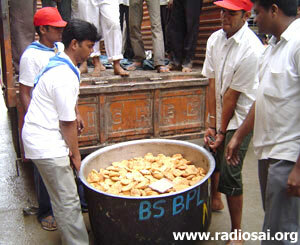 With fewer hands to make the Puris we were really short of the 60,000 target-number for that evening. 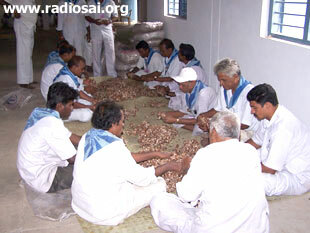 All the Seva Dal started reciting Sai Gayatri and the hands which did the task of lifting those huge vessels with equal ease started rolling the dough. Miraculously in less than 90 minutes we were able to cope up with the lost time because of rain and were bang on target. Later helped poured in from unexpected quarters and the whole operation was a success." Pushing Through the Pain… A Great Learning Experience. "I cannot help but mention the incident with one of the younger Sai Brothers. With rain water all over the canteen floor his feet soaked for a long time to the extent that they turned white in color and wrinkled. He was busy delivering food in-time to all the canteens, collecting the empty vessels. I met him at around 11:30 pm when all the work was done. He was sitting alone on the steps that led to the canteen and was visibly in terrible pain which he realized only after he had fulfilled his duties for that day. He was in that state since morning, but the "movement" did not stop. The sense of duty overpowered his temporary pain and his senses were pushed to do the tasks that they wouldn't have done on any other day. It was a great learning experience to work amongst such simple yet great souls." They did tasks they had never imagined themselves to do...and did it spendidly! "Was There A Divine Hand At Work?" 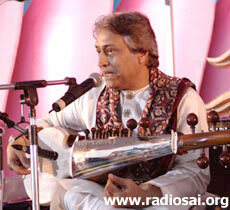 - Gangadhar Sarma. 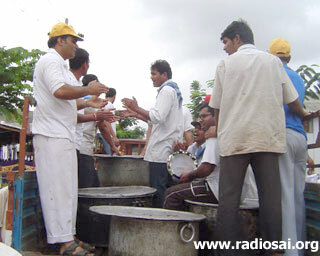 "Though there was a tremendous pressure during the seven day period of free food distribution, the entire team worked in such a manner that the pressure was not felt… during the activity the team could do things that otherwise would not be possible... Bhagavan gave us the strength and energy to do the activity without much stress and pressure. At the end of the Seva, there was a feeling in the team that did we really pull this of or was there a divine hand at work?" "The operations were definitely tough, more so with the large number of devotees present inside the ashram, moving up and down for Darshan and the other programmes BUT the entire operations went off flawlessly without any problem, accident or wastage…. There was a tremendous feeling of togetherness and Love within the team. Though there was tremendous pressure during the seven day period of free food distribution, the youth took it in the most pleasing manner with Sai's Name on their lips and it taught each one of us what Unity can bring. 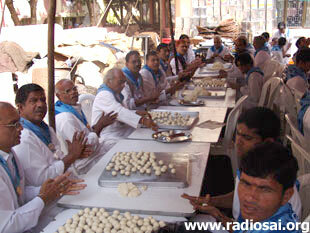 The best part of the Seva was the bhajans our teams were singing while transporting food. That gave us the strength. It was a great team work with abundant blessings from the Universal Team leader – our beloved Mother Sai. Each and every one of the team members felt the divine presence of Swami within him, around him and behind him protecting him as the eyelids protect the eye." Thesham Nithyabhiyouktanam, Yoga Kshemam Vahamyaham." I shall take care and look after his welfare in all respects. "We could feel Swami's all-pervasiveness in every moment. 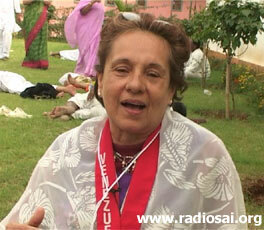 There were many tense moments and in every such situation, Swami gave us relief and eased out our position." It was the Sevadals' total dedication to the cause that drew divine grace and made the whole operation a success. Many would not know that there was even a feedback committee of 8 experienced Sevadal volunteers. These Sai workers discreetly and casually conducted opinion surveys about food quality and quantity from devotees everyday. Every day a sample of 50 enquiries were done at every point which meant 200 responses per session. All these inputs were carefully studied and put to good use so that devotees would have no problems as far as food is concerned. These volunteers also assessed the flow of devotees and helped in making accurate kitchen estimates which was no mean task in planning and forecasting. The fulfillment of the whole exercise was when Swami Himself on the 25 th of November blessed the food committee members by expressing His Ananda, His great satisfaction and happiness on the preparations done and even mentioned how all the devotees ate with satisfaction. That was not all! The most merciful Lord again on the 1 st December blessed the Sevadals saying "You have all done well." Not once, but three times! There is nothing more that every Sevadal could aspire for. Their mission was achieved, their sacrifice had found fulfillment and their work truly had transformed into worship. "This appreciation", Sri Challam, the Sevadal coordinator says, "of our most beloved Lord goes to all the Sevadal, Group Leaders, District Batch In-charges, State In-charges, District Sevadal coordinators and District Presidents who have motivated and conducted training classes for the Sevadals in the past one year and of course to the thousands of Sevadals who worked day in and out in a great spirit of dedication and sacrifice." Well, food was only one of the major arrangements surrounding the 80 th Birthday celebrations. There were many others – accommodation, security, sanitation, crowd control, decoration, maintenance, etc and every one of these activities were done by Sevadal. One could see the youth of Mahabubnagar going around the ashram with water cans on their back distributing drinking water to the thirsty. 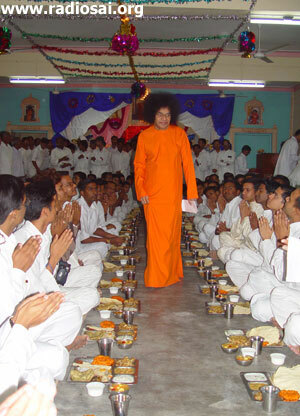 This was their way of offering their gratitude to Swami, who had provided them with drinking water in the year 2001 through the Sri Sathya Sai Drinking Water Project. Another very moving scene was to see the Mahaboobnagar Sevadals utilising trolleys in service. They would rush to the aid of devotees, especially elderly people, who needed help to transport their luggage to their place of accommodation in the ashram. The luggage was placed in trolleys which were wheeled by the youth themselves. What a thoughtful and heartwarming gesture! Nobody had asked them to do it. Some of them were senior executives in reputed companies but this job of a ‘porter' was not menial for them. You cannot help but be moved with their dedication and devotion to their beloved lord. "Generally after Darshan and bhajan the devotees will go out from the Mandir, but from 15th to 30th Nov, in addition to the devotees already within the Mandir double the number of devotees entered in the Mandir for availing the free food facility offered by the Bhagavan. Daily more than 30,000 people entered through Ganesh Gate in addition to the devotees already in Mandir for availing the morning breakfast, mid-day lunch, evening snacks and tea and also evening dinner. Purely because of divine blessings of Bhagavan, we were able to manage the crowd without causing any inconvenience to the devotees." Now, coming to the other principal task – providing accommodation to the hundreds that landed everyday. No effort was spared by the ashram authorities to ensure that none would have to be turned away at the gates of Prasanthi Nilayam and everything that was possible was done with the help of enthusiastic volunteers. In addition to the dormitories that are usually available, more than 25 large shelters were put up to accommodate the hordes who were pouring in by the day. And work on these shelters started months ahead of the birthday. There were separate accommodation arrangements made for the nearly 12,000 delegates who had gathered for the world conference. Every inch of Ashram space was utilized judiciously and a lot of planning went into allotting shelters for every state of India and every region of the world. You could see big boards on the temporary shelters saying –" Maharashtra ", " West Bengal ", etc. 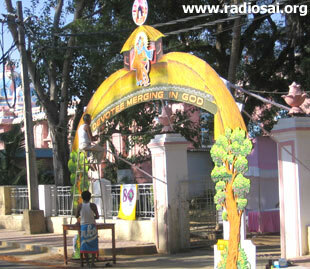 Some devotees were even lodged in the Deena Janodharana Pathakamu complex – the orphanage near the ashram. There were free medical camps running and doctors were available round the clock for consultation and treatment near the large shelters. It was a great sight to see people from different regions and speaking different languages living and moving with each other so cordially and comfortably. In the Sai family, there is no stranger. "Sai Ram" is enough introduction and "Sai" is the common bond. "It's so awesome, so wonderful and so beautiful to see Baba every day. I have had friends who have had their knees healed and operations cancelled because Baba healed them. For myself, Baba is working on me. It's a work in progress. I see so many people who come from all parts of the world. I was very blessed last year because I was chosen to lead the western devotees for Christmas and we had 50 people on a team that were from 35 different countries. It was awesome and you got to hear so many stories of people's experiences with Baba - of how He would come in their dreams, of how they would be motivated to serve Baba in their countries and here. Having read all of the Sathya Sai Speaks books, all of the Vahini books and all of Kasturi's books, it's overwhelming and I am in awe to be in God's presence every day. I say it humbly from my heart because I sat yesterday when Swami came out from the veranda, I started to cry because I felt so much bliss. And we are all so blessed to be here, and I know Swami sits there and He enjoys all of our love for Him as well, because thousands have come here from all parts of the world to be here for Swami's 80th birthday. And we're so blessed to be here now. Today I was helping the overseas and Indian delegates that have come for the conference to find their seating. Everyone is so happy. How can you be somewhere where there is so much love? I've been in baseball stadiums, in Olympic stadiums, everywhere for different events, but this place is special. I know that Baba's wish of Dharma, world wide peace and love everywhere will come true, because if He can find a place in my heart He can find a place in everybody's heart.We all love Baba and I love everybody." This is the real miracle. The way Swami enters each individual's heart and then slowly, silently but surely brings out a U-turn in the individual's outlook. Many years pass and the individual cannot believe the amazing changes that have come about in his attitude towards life and society. And all this happens without Swami speaking a word to the devotee physically even once. His presence is enough. His power is there everywhere. 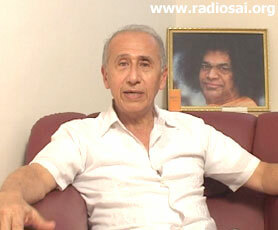 "I met Swami for the first time in 1991. I then came to Whitefield in 1993. Since then my life has completely changed. My life now is full of joy. I never felt myself alone ever since I saw Swami for the first time in the physical form. And now everywhere I go I see a friend walking beside me, with whom I exchange all of my thoughts, needs, fears, joys - everything! 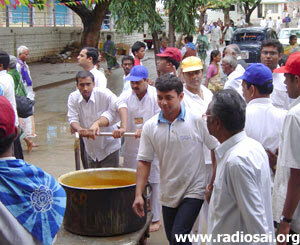 I am proud to be in the Sai Organization and I am doing Seva. All of my life has been reenergized by this meeting I had with Swami. I am doing more or less the same thing I was doing before, but with a different consciousness, with a different way of looking at others. I really hope that with Swami's grace the world will be a much better place than what it is now. Apart from that my whole attitude towards life has changed. Whatever I'm doing now is kind of a Seva for others, including parents, friends, and everyone. I'm proud to be here." The theme of the conference was Unity-Purity-Divinity and you could really see how there was this tremendous feeling of brotherliness. It was a practical demonstration of the power of collective positive thought which can do miracles. "Well, we are here for Baba's birthday and to come here at such an auspicious time is something you have to experience. There are so many people here that have come from more than 170 countries. And I was impressed to see members of so many religions who have converged here - that is something I have seen for the first time and you have to just experience it. You have to feel the love of the people that come to see Swami. I know that it is very difficult for someone to stay here at this time because there are so many people; but the love that He spreads and the love that all the devotees spread all over makes you feel very comfortable. To be at this special place on the Avatar's 80th birthday is something special, because we know that something better is in store for this planet. 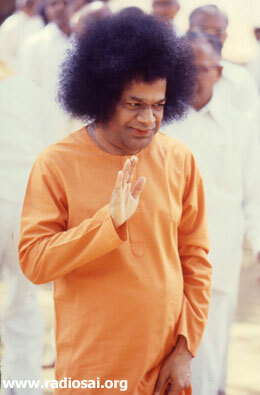 Then, Swami's love for all people is going to spread all over the planet and we are going to live in peace. This is something which He has been telling us for years and it is going to happen." Their conviction about Swami and His message is exemplary and contagious. Each devotee has the golden book of his priceless experiences with Bhagavan in their and that gives all the inspiration and strength that each one needs whenever and wherever. "It's my 6th trip here and I have known Baba for eighteen years. 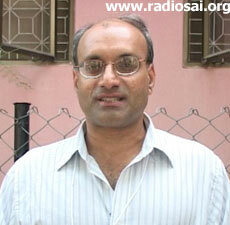 I am a doctor and I have had a lot of experiences there with Swami. Here, for this celebration, for the magnitude of this 80th Swami's birthday, I just can say that the attention, and care to all the devotees was lovely, wonderful. I feel that there was a holy hand, a divine hand - if not, it would be impossible for everything to be so perfect. Talking about my experiences, my husband (who does not believe in miracles) was cooking in our kitchen, when suddenly he cut his thumb badly. I told to him to just put Vibhuti with a bandage. We waited twelve hours to check it and then found that there was not even a mark. His hand was perfect again." In whichever corner of the world he/she may be, each devotee feels Swami's love. 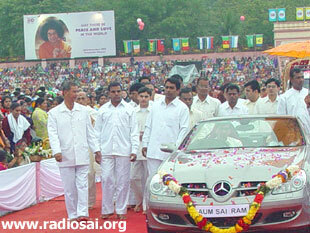 And seeing Swami physically during the grand Birthday celebrations was an experience that was phenomenal. Some devotees from distant countries, who were there in Prashanti just a few months ago during the Guru Poornima celebrations in July, could not allow themselves to miss the big event. The magic of His love and the gift of His Darshan pulled them and they were again back at the Lotus Feet of their beloved! 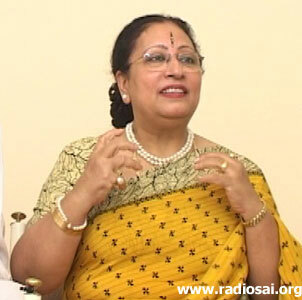 "We were here at Guru Poornima, and we felt so full that we weren't going to come back. But we came back for the 8th World Conference and to see Swami again! And we are just so pleased to see Swami so full of love for everyone. I've known Swami since 1998, and since then I try to follow His teachings. And although I am imperfect, I feel some movement is happening within me. It's such a pleasure to see everybody here from every corner of the world. It is just such a big birthday celebration. We all love Swami and we have all got to learn to give that love to other people as well." 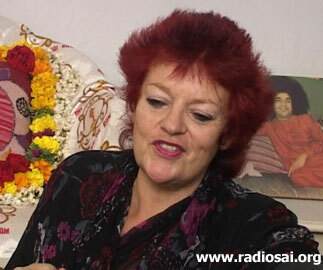 "It's incredible for me to feel the love and the energy of Swami as His presence - and in each devotee too. The best miracle for me is to see Swami move all hearts, to share love and work together. This is the real transformation. I have heard stories about the leelas of Swami, but the most important thing is the change of mind and heart of people. 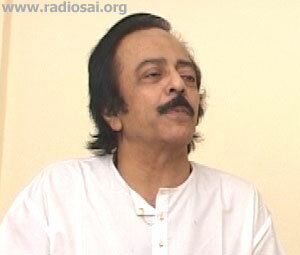 And then to spread Swami's words to the people in more than 140 countries." This was the inspiration with which the thousands who had gathered for the World Conference left – to share Swami's love and His message. Their hearts were recharged and full with the experience of His presence and they wanted to share with anybody they could. And in fact, that is what life is meant for – to share love, to be caring, to realise that there is God in every being. When every man realises and practises this fundamental unity in creation, each one can see and feel divinity in every moment. The golden age truly then would have arrived. A beautiful event associated with the World Conference was the Sai Symphony Orchestra on the 21 st evening where 53 musicians from over 20 countries performed before Bhagavan. There were artists from Asia , Australia , Europe , North, Central and South America and they worked together during five days of rehearsals in a great joyful spirit of unity and love. Their goal was simple – to do their best before their Sweet Lord. Now, we are not going into details of the beautiful compositions they played. You must have read all this in the Prashanti Diary of the December issue. (To read it again, go here.) What we are going to give you is glimpses of the spirit behind their performances - what inspired them to come to Puttaparthi? How did they know about Swami? And what music means to them? "When I came first to Prashanti it was because one of my friends talked about Swami, but actually Swami entered into my life much earlier. Swami is omnipresent. He has created the whole world, He has created me, so there are so many times in my life Swami has blessed me. He gave me my wife. I asked Him to give me a wife who would be able to live around the world and He gave me Johanna, who is a marvelous pianist from Poland. 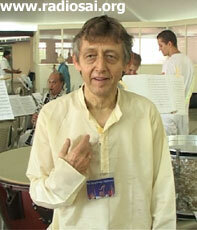 Then we came to Puttaparthi, my wife had a chance to play a piano recital for Swami. And after this, Swami gave me the opportunity to conduct this orchestra. How can I thank Swami for all that He does, because it is a present for me. I conduct the orchestra and I learn so much from Him. Everyday you try to improve, to make better music - you try to seek perfection. You are not perfect, you never achieve perfection - only God is perfection - but every day has a goal with Swami." "My first impression of playing for the Sathya Sai Symphony Orchestra was a year and a half ago, when I was here in Puttaparthi, and Swami called me for interview," says Andrea, a professional musician who plays bass trombone, from Croatia who was also part of the Orchestra. He continues, "In the interview He asked me what my profession is. I told Him that I am a musician and that I play trombone in the symphony orchestra. Then we talked about my profession and I started to have a wish to play in front of Swami. 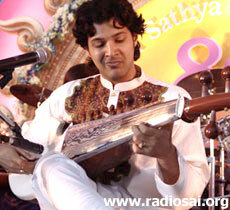 I didn't know that there is an international Sathya Sai Symphony Orchestra. I was also here, 3 months ago. I met some people from the organization and they asked me if I would like to play for Swami - I didn't have to think very long! I think this is the best moment of my career - to play in front of my God in this symphony orchestra. The atmosphere in this orchestra is very good and very positive. We all come from various corners of the world; we just met each other and started playing. So simple and so complicated at the same time. Music is equal to divinity according to me. I don't know what can be more blissful and more divine, because there is nothing in this world that is more divine than music for me. I am a musician and I can tell you that out of my experience. And when you come to Prashanti Nilayam, when you hear bhajans, when you hear chanting of the Vedas, when you hear classical music, you will always find the same vibration; you will always find the same divine fire in all the music. Although they are various kinds of music, the divine fire will be the same." How true! Andrea so beautifully spelt out the soul of music. 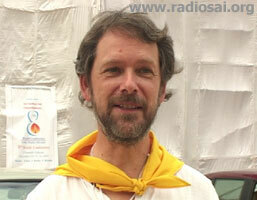 For some of the musicians it was their first visit to Swami like Letora from France . "It's my first time here, and I'm very surprised that there are so many people who have come to be with Swami," says Letora who plays bassoon, a wind instrument, and landed in Puttaparthi just a week before the orchestra. 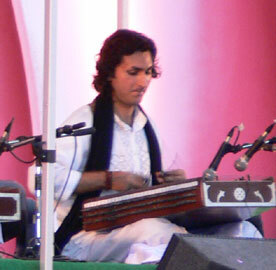 "I am very impressed," he continues, "that we have offered this music to Swami. I love to play music because I think that rhythm has something to do with spirituality. For me, this is the most important thing I have to offer to Swami…. A lot of people are doing a lot of work here. It's wonderful. The village and landscape of Puttaparthi is very beautiful. The weather is good. It's just great to be here." 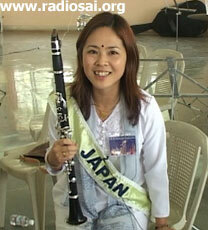 "I joined the concert for the first time. 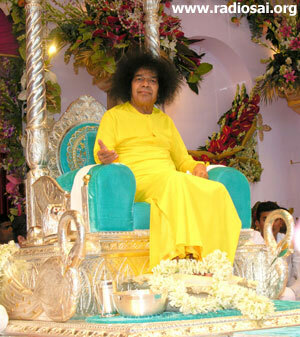 I met Sai Baba this year through my mother-in-law. So this year everything for me is new and I'm really excited. I'm very happy to play the music with this orchestra because everybody is nice and they are helping so much when I can't understand what to do. I'm happy to do for Baba anything concerned with music. Music is my job. I had a really special time at His birthday. I'm very excited now. And what Swami said about love really moved me. Such kind of words I never heard. I'm trying to understand more of Him and the Sai Community." 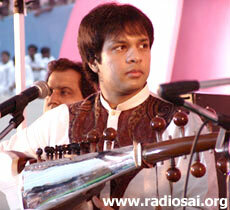 "I like music so much, not only classical western but I like all types of music which is played with love. When there is no love, I don't like it. When there is love, I like it. And this is how Swami wants us to be - full of love. When we go back to our countries, we are there to represent Swami's love. So we come together and play to the physical form, but when we go back we carry the memories." Yes, all the 53 musicians carried back with them memories…memories so sweet that will fill them with bliss whenever recalled, memories that will inspire them forever to divinize not only their music and but also every moment of their life. After the World Conference, we know, there was the Institute's convocation and then the action shifted to the Hill View Stadium for the big day! Not many people know of the elaborate planning and arrangements that were being made in the stadium weeks before the Big Day. More than 150 Sevadal volunteers were engaged in various activities in stadium for more than a week before the Birthday. "The stadium seemed to have woken up from its quite and sedentary ways. The statues in the stadium already wore a fresh coat of paint as if they were all dressed and ready for the grand event. A casual observer would have noticed a team of people busy inspecting the Shanthi Vedika stage and the surrounding galleries. In the days to come they transformed the stage and the stadium into something that resembled a massive royal court! Somebody said, nay, it's a great comfy open air theatre! With the green water-proof carpet all over the area of the ground, the stadium had acquired a totally new manifestation." Yes, the stadium was actually no more a stadium. In fact, many people who had never seen the stadium in its preparatory days were shocked to the ground on the final day - "My God! We cannot recognise this. Is it the same Hill View Stadium that had the cricket ground?" they asked with big eyes and open mouths. 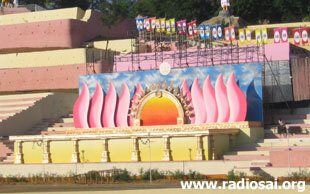 "The Shanthi Vedika stage was getting a complete makeover. Beautiful cut-outs and decorations started adorning the stage. The floor had beautiful tiles now and professional florists from many regions including Japan and Switzerland were busy creating a masterpiece of beauty. And then the ornate lamp-posts along the road…at night fall they lit up like a necklace around the stadium!" says another student and continues, "another neat idea you could not help appreciate was the path that was being made through the center of the ground. Thanks to this red-carpeted centre path, on the Birthday, hundreds of devotees could catch a glimpse of Swami from a distance of only a few metres!" 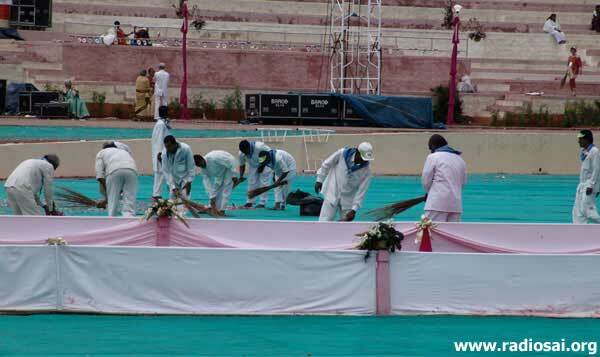 Huge hoardings came up around the stadium days prior to the 23rd conveying what Swami truly is - pure selflessness. 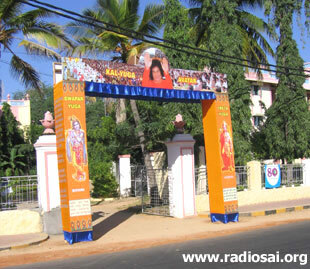 "Your Well-being is my concern", "Your Joy is My Wish", "May There Be Peace And Love In The World" the 40 ft by 20 ft structures stated along with beautiful images of Swami smiling and blessing. And mind you, they were permanent structures in wood and iron which had taken a week to erect. In addition to this, smaller banners with the 80th birthday logo filled the stadium and added so much colour to the setting. 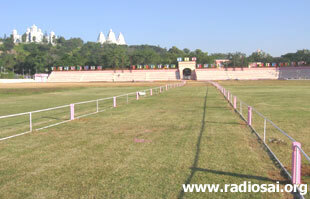 In fact, such huge hoardings were found not only in the stadium but inside the Ashram as well. Not only that, more than 30 such large hoardings were put up even in the city of Bangalore and many more on the way to Puttaparthi from Bangalore. All conveying the immortal message of love and peace of Swami. Apart from the hoardings, there were also beautiful arches on every entrance of Hill View Stadium and even beyond the stadium. All these were the contribution of different states of India. Each coveyed an unique spiritual theme with beautiful art-work. "You could not miss the galleries below the Hanuman statue where a bright lotus like stage was blossoming!" another student currently doing his Ph. D says. "Carpenters, decorators and engineers were busy at work - Painting the flanks, putting up and testing the lights, setting up the elaborate sound system, carrying out tests and fine tuning the performance of each piece of equipment." 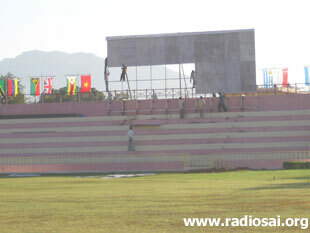 Just beside this stage, there was another big structure coming up - the LED display screen. It was in fact, from one of world's best companies in the LED business - Barco, a company renowned for its longstanding leadership in the visualization industry. There were actually two screens, the second one placed above the pavilion on the gents' side. And these two displays were receiving their feed from eight video cameras set up at different strategic locations all round the stadium. There were even two aerial multi-dimensional ‘speed dome' cameras on either side of the Shanthi Vedika. Thanks to this set up, all the devotees could totally involve themselves with the happenings on the stage and also watch close-ups of Swami sitting on the majestic throne in the Shanthi Vedika. Everybody who was there in the stadium on that blissful evening can never forget the grand fireworks and of course the laser show. The fireworks specialists were from the famous Sivakasi and were people who had handled various other mega-events across the country. Thanks to their expertise and also divine grace, in spite of the intermittent rain they lit up the evening sky on the 23rd with one of the most spectacular fireworks displays that Parthi had ever witnessed - the rockets went up to 100ft into the sky and many lit up a diameter of 125 ft with sparkling colours. Coupled with the laser show, these two events really mesmerised the devotees with the delightful play of sound and light and made the evening so very memorable. "We feel so blessed to have been able to perform in the divine presence of Baba on His eightieth year. It was so moving to see lakhs of people sharing the music in complete devotion that evening in Puttaparthi, in spite of the constant drizzle. Ever since our entire family had Baba's Darshan and Blessings, we think of Swami constantly and feel blessed in every way every day of lives. We just feel so fortunate to have been here to witness this great day and get Baba's blessings." "Well..where should I begin...I first went to Him about 12 years ago and He had a mesmerizing impact on me. I was called back to the interview room and sat before Him while He told me all from my inhibitions and my life, etc. Then out of the blue He materialized a navaratna (nine gems) ring and put it on my finger. I thanked Him, and left. For a few nights, when I used to practise the santoor and then go to sleep, He would appear in my dreams and encourage me about my practice. It was amazing and then later when I would meet Him, He would tell me about my dreams. I've had the fortune of playing at least 3 or 4 times on stage for His birthdays, in His presence. I have been truly blessed and received many tokens of His blessing, a wrist watch and Amrit Kalash [nectar of the God's]. The most amazing memory I have was when I was in Dubai and the tyre of the car I was traveling in at high speed burst and the only name that came to my lips was, BABA..BABA..BABA...as I looked at the ring and prayed for a miracle as the car crashed into the road divider and turned turtle and drifted to one corner of the busy highway. I came out unscratched and was taken to a clinic in Dubai for a routine check up and the first thing I see in the clinic in Dubai is a huge picture of SATHYA SAI BABA. That says it all! Later when I was in Puttaparthi, Baba narrated the entire incident to me about the accident and how it all happened. He knew it all! I feel grateful, that in this lifetime I have been able to receive His blessings and still continue to receive His warmth and love." "Believe it or not, for two minutes we could not sing with the emotion choked in my voice. Bhagavan was sitting before us, I can't believe it - we had heard about Him and that day… was it true that we were going to sing for Him? I was pinching myself… where was I, was I really sitting in front of Him? It was an unbelievable experience. And from that day onwards we became His devotees…. Whenever we come here and sing before Swami, I have very good experiences. Whenever I am with Swami and suppose somebody is playing or singing, Swami just looks at me or I just look at Swami and we just communicate like that - how the concert is going on, how nice it is, how divine it is - it is like a mental conversation, like father and daughter. There are so many things you learn. Baba has taught us many things and whenever I sing, you know, Baba is sitting there. I feel some more life to our music, some sort of energy and vibration and I feel so much at peace and I become a different person. I go to a different world with Swami's appreciation and Swami's power. He charges me with energy. It is so divine that I don't care for the world. I look at Swami and Swami looks at me and it is something like a booster rocket - that kind of energy I get. Whenever I come here and sing, the satisfaction that I get, I don't get anywhere else because this is divine satisfaction. We are all professional musicians; we work hard and earn money. We sing for the gallery, we sing for the masses, we sing for class - but here we sing specially for God; we imbibe the divine atmosphere. We feel as if we are singing in a Durbar, Swarg, and Heaven. God is sitting before us." "Sometimes we feel that what we got from Him, a child won't get from his parents - the way we got so many things from Baba. We will definitely serve and obey the orders of Sai; all our life is devoted to Him. Not only this life but for all lives to come we will be devoted to Him and we will do whatever He says." "I have sung beside Him when He sat on the side of the stage with me. That is a strange dichotomy for as a performer you are meant to be performing for the audience out there, but at the same time there is this Presence. So you sing for the audience but occasionally I will give a little glance to Him but would not sing straight to Him. A lot of people have said it must be so emotional when He is sitting there. But in fact it is not; it is as if on the day of the concert He switches off my emotions because if I was emotional at that point I would be overcome with bliss and choked with emotion. I do the job, I feel the joy but I focus on the job. But if I am on my own during a rehearsal I am often in tears of joy and sometimes it is as if it is not my voice and I can cry over the lyrics." "I try to bring His teachings into the blues lyrics and I am proud that I have even just heard of Him because I spent up 23 years thinking that all the holy saints lived in the old days. He has shown that His omniscience, omnipresence and omnipotence is so overpowering that I think of Him at every step. And sometimes it is harder here with the physical form as He may not be talking to you -so forget the interview, it is the ‘inner view' that counts!" How true and revealing…yes, numerous are the occasions when Swami has mentioned that man has reached the moon and the depths of the ocean but not an inch within himself! In fact, all His interviews are to persuade us to see inside. SAI means to See Always Inside and millions derive inspiration from Him from within. His 5'3" physical frame is just an easy and sweet medium for us to derive bliss with least effort. But to remain in that bliss at all times, one has to internalize Him. Well…there is no end to the experiences of devotees, be it Sevadals, artists or professionals who had come for the 80 th Birthday. Dear reader, the whole idea of this cover story was to give you those glimpses of the historic event that was the 80 th Birthday that many were unaware of and therefore not touched by it. We hope that the great stories of service and sacrifice of the Sevadals and the amazing experiences of various people from all over the globe and from different walks of life that has dotted this cover story inspire you, enliven you and give you another opportunity to revel and bask in the glory of Sai. We are grateful to D J Das, Hari Shankar, Sudhindran, Gopi Krishna, Alex, Sri Challam and many other Sevadal members for their active cooperation and inputs.